Smart Cookie: Let Them Eat Cake! At the end of last month I hosted a French themed party to try making all the various french foods that I sampled while on my honeymoon, not the least of which were some macarons like the ones pictured above at Pierre Hermé. 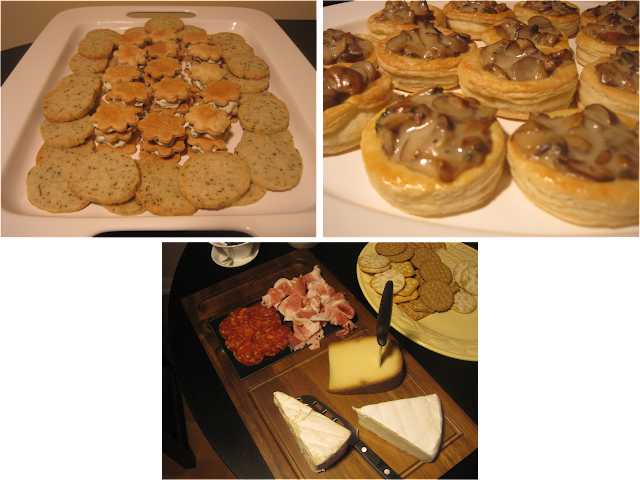 There were savoury and sweet treats and all the wine we could handle! First up, orange flower water marshmallows. Now that I have my precious tangerine KitchenAid stand mixer, these things were so easy to make and so much better than storebought marshmallows. Financiers and madeleines. Madeleines were perhaps my favorite thing that I discovered in France. And apart from the hassle of getting the specialty pan, they are really easy and the recipe makes a ton of these mini ones so you won't have to worry about not having enough for guests. And of course, who could forget macarons! I made three different kinds, but to make it easier, I used the same swiss meringue buttercream frosting base for all of them and then just divided it into three and then added flavourings. And to make it even simpler, two of the kinds had the same chocolate macaron shells. The first kind was oolong milk tea flavoured with honey swiss meringue buttercream filling. This tea is a gem that we discovered at David's tea and also one of the teas we used for our wedding favours. All you have to do is grind it into a powder and sub in for part of the powdered sugar. This would work equally well with any strong flavoured tea such as Earl Grey. Then there were chocolate orange and chocolate chili macarons. So that people wouldn't be startled, I marked the chili ones with a red stripe. And last but not least, the savoury snacks. Parmesan and herb shortbread, savoury green veggie and goat cheese millefeuilles, mushroom vol-au-vents, and of course, a selection of meats and cheeses, olives, crackers, and bread. At the end of the night, all the food was gone and I think people left pretty happy (and not just because of the wine). Themed parties are fun! Until next time, au revoir mes amis!